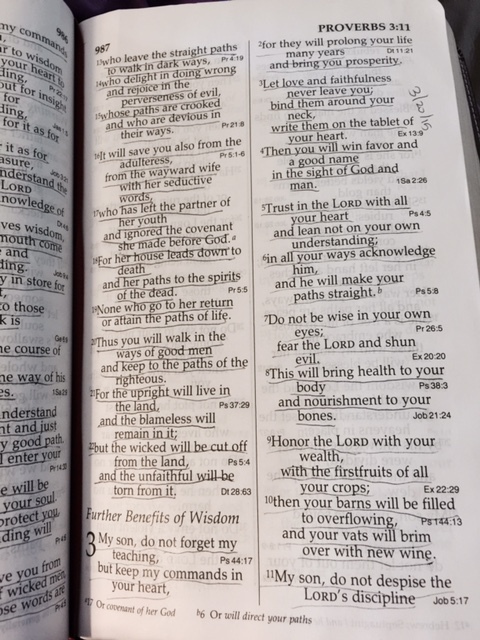 As we memorize Proverbs 3 together, we are internalizing a lot of wisdom right from God. 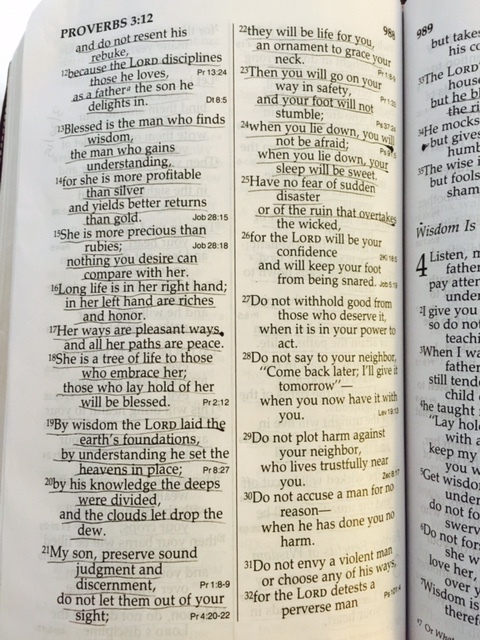 Do you hear him talking with you through these verses? Honor the Lord with your wealth, with the firstfruit of all your crops. Then your barns will be filled to overflowing and your vats will brim over with new wine. My child, do not despise the Lords discipline and do no resent his rebuke because the Lord disciplines those he loves, as a father, the daughter he delights in. By wisdom, the Lord laid the earth’s foundations. By understanding, he set the heavens in place. And by his knowledge, the deeps are divided and the clouds drop their dew. My child, preserve sound judgement and discernment, do not let them out of your sight. For they will be life to you, an ornament to grace your neck. Then you will go on your way in safety and your foot will not stumble. When you lie down, you will not be afraid. When you lie down, your sleep will be sweet. Have no fear because the Lord is our confidence! Do not be afraid. Have no fear. Why does God say something like this to us so often in his Word? Fear is a weapon of Satan. He keeps us busy with our worries. He focuses us on the negative. He uses fear to weaken our faith. Fear of the unknown swirls around in our heads all day and fills our minds in the darkest part of the night. Unless we let our trust in God conquer those fears. God is omnipotent – he can do anything. He promises us that he wants the best for us. We are his children. He is at work all the time around us. We have nothing to fear……when we trust. Yes, bad things still happen to us. But God will be there. He will guide us through. He loves us. I really like the promise about the Lord keeping my foot from being snared. Yes, bad things still happen to me but, at least, the Lord is helping me to avoid making choices and decisions that are bringing even more bad consequences my way. We can have no fear.